Raith Rovers latest signing has revealed his delight at joining the League One club despite dropping down two divisions in the space of a year. Grant Gillespie started last season in the Scottish Premiership with Hamilton Accies before moving to Championship side Dundee United in January on a short-term contract. The 26-year-old midfielder admits that his campaign did not go according to plan, but he is now relishing the chance to reboot his career after signing a two-year deal with the Kirkcaldy club. “It’s a new experience and I’m looking forward to it,” Gillespie told the Press. “I’ve not played in at this level before, but I’m not going to say that I should be playing in the Premiership because the reality is that I’ve found myself here, and that’s football. “I didn’t have best of seasons last year and there were a couple of factors. I came back into pre-season a bit unfit, then I got injured at the start of September and was out for 10 weeks. I was always playing catch-up. “I went to Dundee United and it was a bit of a turbulent time. They were expecting to go up, and trying to claw back to St Mirren was a big task. “Going out in the play-offs to Livingston was bitterly disappointing, but now I’m happy to be here and looking forward to a fresh start. Gillespie made his debut for Hamilton at the age of 16 and made almost 200 appearances for the Lanarkshire outfit, almost half of which were in the Premiership. He also knows what it takes to win promotion having helped Accies reach the top flight through the play-offs in 2014 at the expense of relegating Hibs. Signing a player with such pedigree looks a shrewd piece of business and Gillespie revealed that assistant manager Kevin Cuthbert played a crucial role in making the move happen. “I was on holiday last week and Cat phoned me and asked about my options,” he said. “I played with Cat at Hamilton the year we got promoted through the play-offs, and after speaking to him and hearing about the way they wanted to play, and that they were looking to go one better than last year and win the league, my mind was made up that I wanted to come here and have a good season. 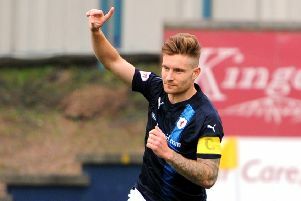 Gillespie hopes to use his experience of playing regularly at the top level in Scotland to help Raith clinch the League One title after narrowly missing out to Ayr United last season. “I’ve been privileged to have played so many games at a good level,” he said. “From a young age I’ve been used to playing first team football, and you have to learn to grow up quick, and I feel I’ve done that. “I’m 27 in a couple of weeks, which is still relatively young, but I feel like I’m an older experienced player. Gillespie describes himself as a defensive midfielder, who looks to do both sides of the game. “I predominantly sit in front of the back four and try to keep it as simple as possible and give the ball to more attacking, creative players,” he said. “I don’t mind a tackle, or a yellow card, but touch wood I’ve never been sent off. I don’t mind the dirty side of the game, but I also like to play good football, get on the ball and keep it simple. “Coming through as a young boy at Hamilton I was always taught to try and play out from the back and get on it as much as you can, especially in the position I play.